In May 2011 the NHTSA crash tested a Chevy Volt. Three weeks later it caught fire while in a storage lot. In November 2011 the news was released to the public. Following this a politically motivated firestorm erupted. The political firestorm almost entirely exaggerated the actual danger to the point of committing actual lies. Generally those doing the exaggeration were extreme right wingers who are collectively also committed to destroying President Obama&apos;s administration and re-election chances in 2012. For example, one of the lies is to claim that President Obama pushed for the Chevy Volt, calling the Volt Obama&apos;s baby. However the truth is that the Volt project was launched in 2006 by GM, wholly by GM&apos;s choice, with no pushing by the government. For the record, this is the Volt which burned and touched off the whole story. First, the cause of the fire was clearly due to a piece of metal intruding into the battery pack, poking a hole in the pack, breaking some of the battery cells, rupturing coolant lines, and causing short circuits. Over a period of weeks some kind of condition built up which resulted in the fire. "The intrusion alone can cause cell damage, shorting of the battery pack negative bus bar, and battery coolant leakage." They demonstrated that the coolant is conductive at the high voltages present in the battery pack. The crash test procedure included a rollover that caused coolant to slosh around and exacerbate short circuits. The windshield and rear view mirror were "dislocated" from the vehicle. That is, they were found on the ground well away from the vehicle. The manner of this indicates a "pre-fire pressure event" (a.k.a. explosion) they believe was due to cells venting electrolyte due to a thermal event (a.k.a. heat) in the battery pack. The report states with certainty that the fire started in the Volt. It notes that several components were found well away from the car, undamaged by fire. The report goes on to talk about a "high-pressure event" (a.k.a. explosion) that had to have preceded the fire, and it was the high pressure event that would have caused these components to be flung from the Volt. At least seven areas between the passenger cabin and battery tunnel were breached during the crash test. These holes were produced by arcing due to battery cells shorting to the car body. The arcing was due to structural metal bands that run around the cells becoming positively charged during the fire. In other words, something in the pack shorted to the metal bands. The NHTSA was never able to directly replicate the fire despite several crash tests. They did sort of replicate a fire in a condition that was similar to the crash test, and it was then that they opened the investigation. As a general observation - as the temperature around a lithium-ion battery cell rises, electrolytes and organics begin to vaporize within the cell. This increases the pressure inside the cell. The LG P1 cells in the Volt battery pack are pouch style cells, meaning they&apos;re enclosed in a plastic/foil pouch. In pouch cells the gasses vent out the top of the cell, because its the structurally weakest part of the pouch. In the Volt battery pack, this is the only part of the cell not supported by other components. The vented gasses are flammable and easily ignitable. The report thinks the likely specific source of the fire is physical damage to cells 198-204 in the battery pack, the damage causing an internal short inside the cells, resulting in conditions that eventually released electrolyte vapors, causing the fire. Another possibility is the VSTM boards at the top of the pack. These were exposed to coolant that could have left a conductive carbon film on the electronics. This could have caused an internal short. Some right wing (Republican) naysayers had been focusing ire on the Chevy Volt as part of their vilification of the Obama Administration green jobs green technology vision. We&apos;ve seen these people destroy many projects or people over the years. Their dander gets up about something, and they all gather around that thing making up any story they can think of, even totally false fabricated stories, all in an effort to create a negative taint they can paint on their target, and repeat that negative taint on every opportunity. An example? One prominent example is how they destroyed Al Gore&apos;s reputation by creating false stories such as claiming he claimed to have invented the Internet. Truth is he never made any such claim, and at the same time in the late 1980&apos;s as a Senator he did critical political work to expand the Internet (specifically the NREN expansion) that was later a critical part of the commercialization of the Internet a few years later. A discussion of the political attacks against the Chevy Volt is on the blog (see http://blog.greentransportation.info/2011/12/political-fallout-from-volt-battery.html). An example of the sort of attack was a rant by Rush Limbaugh in December (see Regime Covered Up Chevy Volt Dangers) which was full of inaccuracies, exaggerations, and more. Limbaugh has been attacking the Volt with lies (see Rush Limbaugh shows clueless idiocy about electric cars) for a long time so there is nothing new about him doing so now. 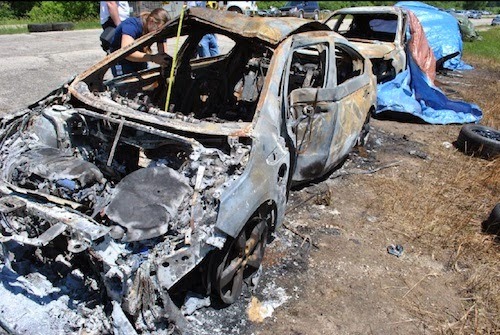 Chevy Volt crash test fire proves it&apos;s a dangerous car As we see below, there was only one fire in a complete Volt during crash tests, and two fires in battery packs when tested in isolation. In each case the fire took 1-3 weeks to develop. This is far less dangerous than a gasoline powered vehicle which are so dangerous they routinely burst into flames. "government incompetence when interfering with the free market" GM began the Volt project long before the Government bailed out GM, taking an ownership stake in GM. The government reportedly fought to cancel the Volt project, but Bob Lutz and the GM board fought to keep it going. GM&apos;s bankruptcy actually reflects negatively on GM&apos;s management but somehow these naysayers have made it into Obama&apos;s negative baggage because of the bailout. $250,000 per car in subsidies ..bogus..
Dec 22, 2011 Compliance Side Pole No No No ?? On May 12, 2011 the NHTSA conducted a NCAP side-pole crash test of the Chevy Volt at a test facility in Washington. The facility is owned and operated by NHTSA Contractor, MGA Research. Based on its performance the Volt received an NHTSA five-star crash-safety rating for both frontal and side-impact crash-worthiness and occupant protection. 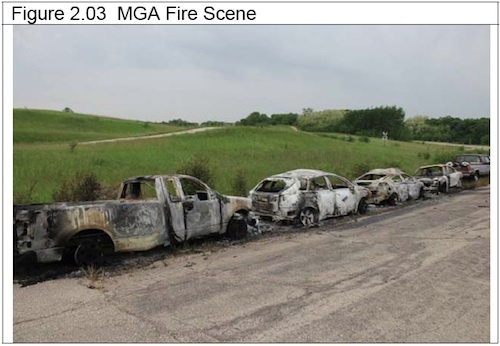 On Monday June 6, 2011, personnel at MGA Research notified the NHTSA that a fire had occurred over the previous weekend. The fire involved four vehicles total, one of which was the Chevy Volt. The vehicles were in a storage facility which, as you can see, was more-or-less a road next to a grassy field. Local fire authorities conducted an initial fire investigation, initially focusing on a possible arson. The NHTSA contacted Hughes Associates, a battery and fire expert, to investigate the cause of the fire. Their initial forensic investigation took place June 13-14, 2011 at MGA Research&apos;s facility. The report was available in July 2011, showing the fire probably originated in the Chevy Volt. The F150, the Lexus and the Volt were parked front-to-back in a line, and the Charger was parked so its nose faced the nose of the Volt. The vehicles had a minimum of ignitable fluids and most of the 12v batteries were disconnected. The Chevy Volt battery pack was disconnected at the Manual Service Disconnect. The only remaining source of fire was electrical energy in the battery packs, especially the big pack in the Volt. This is a rich coincidence, is it not? The same day MGA Research found the smoldering Volt on their storage lot the NHTSA announces a perfect crashworthiness rating. But as noted above, nobody knew on June 6 what was the cause of this fire. I was unable to find a matching NHTSA press release, only this note on a blog run by the National Fire Protection Association. By June 21 the NHTSA clearly knew about the Volt fire and as we see in the surrounding events in this timeline had a forensic study well underway. The NHTSA Special Crash Investigation Division and GM began monitoring all crashes involving Chevy Volt&apos;s. These included some severely damaged vehicles. No fires. Additionally NHTSA investigated two incidents where Chevy Volt&apos;s were in garage fires. In each case the Volts were parked in a garage that caught fire. In both cases it was determined the Volt&apos;s were not the source of the fire. The Volt in question was shipped to the NHTSA&apos;s Vehicle Research and Test Center (VRTC) in East Liberty, Ohio. Hughes Associates, NHTSA and GM engineers conducted a vehicle teardown. Inspection revealed that a "transverse stiffener" that&apos;s normally beneath the drivers seat had penetrated the tunnel into the battery pack, damaged cells in the battery, and ruptured the coolant system. 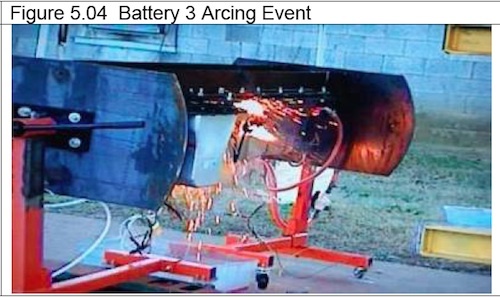 Battery pack disassembly occurred on June 20-23, 2011. The NHTSA performed another crash test at MGA Research&apos;s facility. By this time they will have had a fairly good idea of the cause of the fire, and clearly wanted to see if the fire could be replicated. They outfitted the test vehicle with additional cameras and data collection devices. The crash test did not result in the battery pack being penetrated, no coolant leakage, and no fire following the crash test. Having determined the battery pack in the Volt was the likely cause of the fire, the investigators turned to developing a way to test the pack, so they could verify their theory of the cause of the fire. This test would be of just the battery pack in isolation from a car. It would create the same impact and rollover scenario, but just with the battery pack. This case has eerie connections to a set of EV1 fires during the EV1 time period. In those cases a few EV1&apos;s caught fire while being charged, and it was discovered that a design flaw in the EV1 caused the fire. GM performed a recall of the EV1&apos;s, keeping them for months before implementing a fix and returning cars to lease-holders. Began working with the National Fire Protection Association to identify all vehicles with lithium-ion batteries on-board and develop appropriate steps for handling these vehicles after crashes. 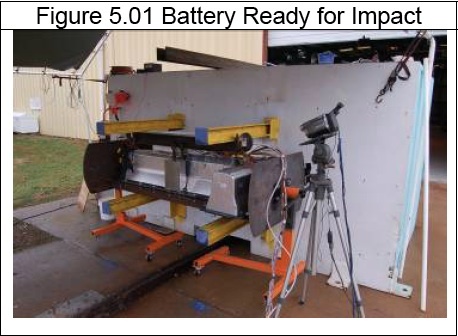 The NHTSA, using the previously developed procedure, tested a total of six battery packs at General Testing Laboratories (GTL). Some of the tests were in mid-November, the others in early-December. Testing of the coolant had shown it was conductive at high voltages, and therefore that the coolant could cause electrical shorts. In one set, the packs were impacted and then rotated through a full 360 degrees just as in the car crash tests. Battery coolant system was intentionally ruptured to be sure the circuits were wetted by coolant. Another set of tests were meant to test the effects of cell damage, and of a bus bar being shorted to the chassis. These tests were performed in mid-December. GM: Buybacks a "last resort" for Chevy Volts: (Dec 1, 2011) Says that GM is considering buying back Volts as a last resort, but that the first steps are to talk with any concerned Volt owners and provide loaner cars. GM will recall all Volts if necessary based on results of the investigation. GM offers to buy back Chevrolet Volts after crash tests show fire risk: (Dec 1, 2011) AP news report quoting GM CEO saying they&apos;re willing to buy back Volts and also conduct a recall. Today&apos;s Volt Update: GM Buyback, Owners Rally, Sales Goal Unmet: (Dec 2, 2011) Refers to the AP news item saying GM CEO offers to buy back Volt&apos;s or offer loaner cars. GM spokesperson admits they&apos;re unlikely to make the 10,000 sales goal. Beginning steps of Volt owners rallying to write an open letter to GM. If there were proof of this sort of effect that would be one thing. But to claim this while having no such proof is yet another thing. It makes one wonder whether this Forbes writer is a propagandist. No post-crash fires occurred in the Nissan Leaf. Further the Leaf battery pack is fully encased in steel. We should note that the vulnerability in the Volt pack was partly due to intrusion of an object into the pack, damaging some cells, and partly due to bus bars in the battery pack grounding to metal in the battery pack. The steel encasing in Nissan&apos;s battery pack runs the risk of similar grounding of bus bars against that steel case. December 16 2011: Frank Beckman says "Time to unplug Volt hysteria"
Frank Beckman appears to be a prominent Detroit area media personality. He&apos;s also firmly in the Conservative/Republican camp. He published in the Detroit News an op-ed complaining about the level of animosity being aimed at the Chevy Volt by his fellow conservatives. (see: http://www.detroitnews.com/article/20111216/OPINION03/112160340/1031/opinion03/Time-unplug-Volt-fire-hysteria) According to Beckman it&apos;s time to stop the hysteria because it&apos;s completely misguided. His piece goes step-by-step through the points being raised by naysayers, demolishing each of them. It&apos;s an excellent piece. In an interview Dan Akerson (GM&apos;s CEO) said they&apos;ll build 60,000 Volt&apos;s in 2012. (see http://www.torquenews.com/1075/gms-ceo-akerson-wants-build-60000-volts-2012 and http://www.freep.com/article/20111218/BUSINESS0104/112180444/Akerson-is-candid-about-GM-and-rivals) He apparently was talking about factory capacity to manufacture the car. A few weeks later he was quoted saying that GM will adjust the number manufactured to meet actual demand, obviously so that GM doesn&apos;t get into an oversupply condition with the Chevy Volt. But that latter statement has been taken by the naysayers as questioning whether GM is planning to back away from the Volt. GM had proposed a field fix (to stiffen the battery box). The NHTSA observed the installation of the fix into a Chevy Volt which they shipped to MGA Research in Wisconsin. On Dec 22, a side-pole crash test was run. The vehicle was monitored for three weeks. There was no intrusion into the battery pack, no coolant leakage, and no fire. On Christmas Eve A123 Systems and Fisker revealed they&apos;d found a battery pack flaw that could cause fires. (see: http://www.torquenews.com/1075/a123-systems-finds-problems-batteries-fisker-karma) They initiated a recall to fix the problem (a hose clamp improperly installed). (see: http://www.torquenews.com/1075/fisker-announces-recall-karma-following-a123s-disclosure-battery-pack-mistake) The recall was finished by mid-January 2012. 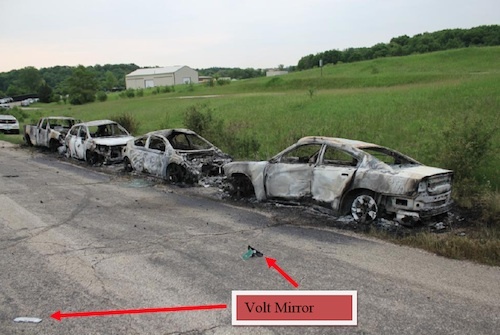 The hearing is titled "Volt Vehicle Fire: What did NHTSA know and when did they know it?" During 2011 at least two garage fires occurred in which a Chevy Volt happened to be in the garage. In all cases the Volt was cleared of responsibility in causing these fires. The NHTSA report discusses and refers to each of these fires. UPDATED: Who Knew a Single Garage Fire Could Spark So Much Electric Car Bashing? http://www.plugincars.com/who-knew-single-garage-fire-could-spark-so-much-electric-car-bashing-107047.html :- (April 18, 2011) A Volt owner in Connecticut had his garage burn down while the Volt was parked inside. Initially there was bashing because of this fire, but later evidence showed up that the Volt owner was at fault because of his other electric car - a home EV conversion. Exclusive: Chevrolet Volt unofficially cleared in Connecticut garage fire: http://gm-volt.com/2011/05/18/exclusive-chevrolet-volt-unofficially-cleared-in-connecticut-garage-fire/ (May 18, 2011) The Volt was cleared from being at fault, by the Fire Marshall. GM To Investigate Volt Blaze Re-Ignition: http://www.thetruthaboutcars.com/2011/04/gm-to-investigate-volt-blaze-re-ignition/ (April 18, 2011) It appears that the Volt in this incident re-ignited itself five days after the initial fire. Curious given the re-ignition of the crash tested Volts. Additionally it&apos;s clear here that the fire was caused by the car owner because of what he was doing with his home-built EV conversion. After N.C. Fire, Duke Energy Advises Customers to Suspend Use of Electric Car Chargers: http://abcnews.go.com/blogs/headlines/2011/11/after-n-c-fire-duke-energy-advises-customers-to-suspend-use-of-electric-car-chargers/ (Nov 6, 2011) A different house fire, in North Carolina. Again the fire officials weren&apos;t calling the Volt to be at fault in the fire, they&apos;re quoted saying the fire could have come from anything in the garage, but at the same time the local Utility called for customers to stop using the chargers. House fire investigators say Chevy Volt charger not to blame in North Carolina blaze: House fire investigators say Chevy Volt charger not to blame in North Carolina blaze A side issue is a house fire that occurred in a garage in which a Volt was parked and plugged-in. "Garland Cloer, Iredell County�s chief deputy fire marshal, said it appears the fire did not start in the electric car. He wouldn�t say more about the fire�s origin, because investigators for several agencies and manufacturers are still examining the debris."